After an overview walk, head to the Spanish Riding School where a Stable Guide will be waiting for you. This is the oldest and last Riding School in the world where classic dressage is still practiced in its purest form. This Institute was founded in 1572 and its very name gives away the fact that the horses were of Spanish origin. The Lipizzaner is regarded as the oldest classic horse race in Europe. The superb arena - the Winter Riding School in the Vienna Hofburg (Imperial Palace) in which the Riders of the Spanish Riding School train the horses and where they perform was commissioned by Emperor Karl VI. His portrait decorates the white baroque hall built by Josef Emanuel Fischer von Erlach from 1729 to 1735. 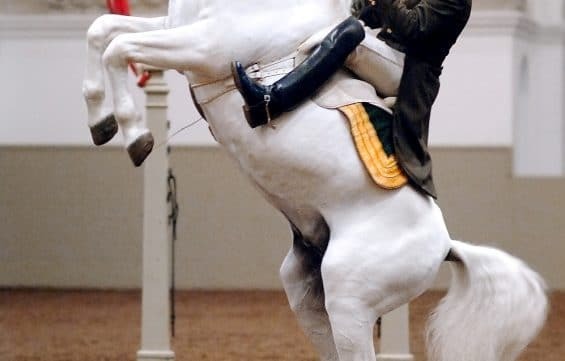 Since 1920 the presentations of classical dressage have been open to the public. This morning you can step inside the royal box to see the morning training session that is going on. This is where the riders put the horses through their paces to music. You may see the horses performing some minor tricks as they work through their exercises. Your stable guide will give you insight into what you’re seeing, which tricks are being practiced and information about the riders and their horses. Afterward, your stable guide will give you an introduction to the school, its history and its riders. You will have a private tour of the arena, the stables and the equipment room.